I had an older brother/sister who would sit me down on the couch while I tried to do my math homework. I would drop my pencil, look up and listen to his/her recount of every single contact made on the ball at the most recent volleyball match. Every mistake was highlighted for dramatic effect. I became more intrigued the longer big bro/sis would talk about other people playing volleyball. After flunking several math tests I decided to try volleyball for myself, since I knew so much already. At tryouts, the coach made a great two-hour slide show presentation with bulleted phrases with exciting words like "bump," "set" and my favorite, "smash." It was after the 24th slide that I was hooked. I made the team because I truly understood what "C'mon, don't miss your serves!" meant. We would practice not missing our serves by standing in long lines waiting for our turn to not miss. My favorite part of game day was when coach would call a time-out and tell us other things not to do. The longer the coach talked, the better we got at waiting to not do things wrong. I would imagine myself doing great things, if only the net was lowered...and if I could listen to the great volleyball masters talk about when they used to play. Can we play now, Coach? The Wootton-BCC match was fun to watch because the teams showed up to PLAY. It is competitive matches like this that should feed the desire to play more. And, to play better. I could drone on. 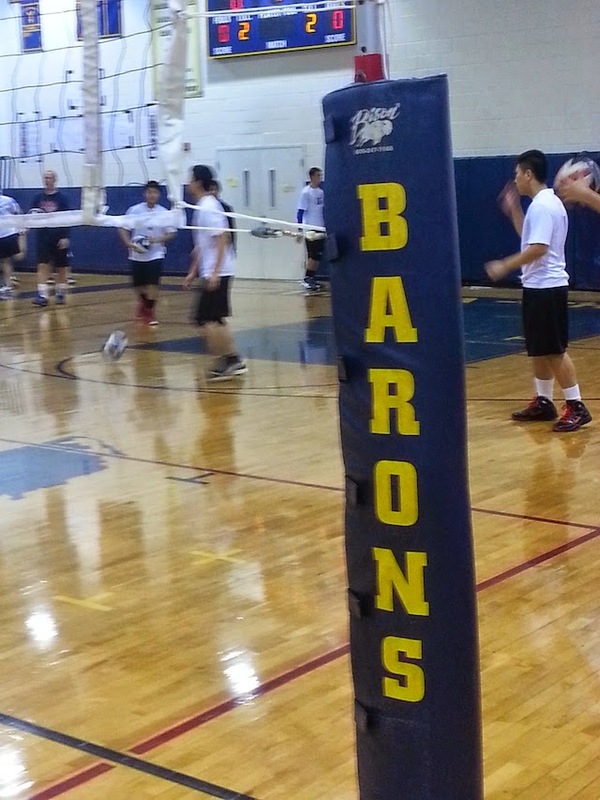 Kudos to the Barons of BCC and the Wootton boys for competing on the court. It's about halfway through the season and there is a lot of playing to be done. And learning. The game teaches the game. Wootton returns home to play Walter Johnson on Friday, April 4. The boys match follows the 5:15 pm coed match.